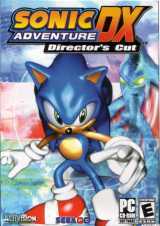 An updated version of the Sega Dreamcast hit Sonic Adventure, the first appearance of Sonic and the crew in a full 3D action title. Once again Sonic is up against Dr. Eggman, who had teamed up with Chaos for the ultimate opportunity to take over the world. Tails, Knuckles and Amy join in on the action, along with a host of new characters and enemies. Choose from 6 playable characters and go all-out in 30 massive levels. New mission mode gives you thrilling high-speed action as you run and jump in gorgeous original game worlds. Round up and interact with the little creatures in the Chao gardens to open up new levels and challenges. Also features 12 fantastic unlockable Sonic Game Gear games.